Whenever you need an application, and you find it at a third-party source, you should think twice before clicking the download button. 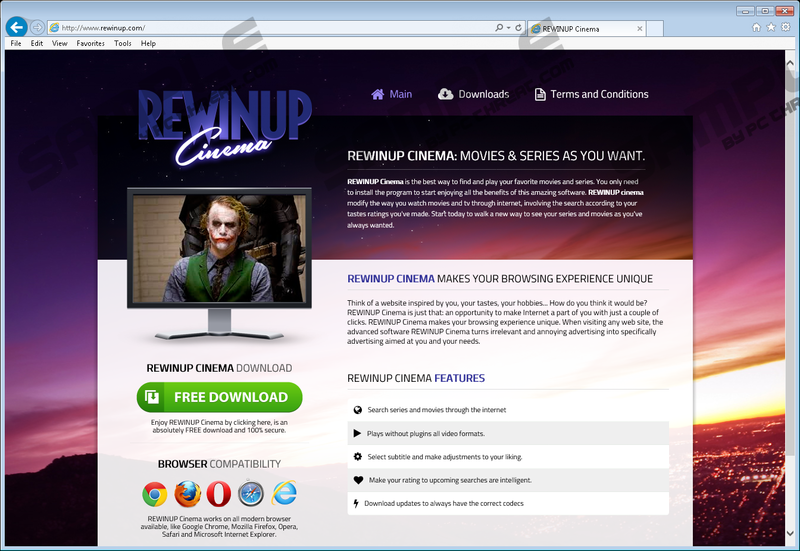 It is very likely that you will end up downloading a lot of wanted programs such as ReWinUp Cinema. This application is not an immediate system security threat, but you most definitely would not want to have such a thing on your system. This application is an adware program and as such it spams you with annoying commercial content in order to make easy money. Your job right now is to remove ReWinUp Cinema from your PC for good because you need to avoid any potential malware infection threat. As mentioned, ReWinUp Cinema is not a severe computer infection, but it could lead to one because such applications are often exploited by malevolent third parties. Adware programs are very vulnerable and cyber criminals can take advantage of them without any second thought. Before you know it, you may accidentally click some pop-up ad that reroutes you to an unfamiliar third-party website associated with malware distribution. Since ReWinUp Cinema is not responsible for the security of the third-party content, keeping the application on your computer becomes a highly risky activity. Technically, there should be at least two ways for the program to enter your PC, but as of now, we have confirmed only one. The point is that we could not find a working direct download link for this application. Although we were able to access its website via rewinup.com, the download button over there does not work. The website looks reliable, and it gives a positive first impression about ReWinUp Cinema itself, but with the official download link down, we can only assume that users install this application unwillingly when they download apps from file-sharing sites via the Vitallia installers. These installers are known to distribute the Multiplug family adware, so you can be sure that without ReWinUp Cinema, you have several other unwanted applications on your system. If you want to find out the current status of your system’s security, you should run a full scan with the SpyHunter free scanner. If any unfamiliar applications are found, you can remove them manually via Control Panel or automatically with the security program of your choice. Take note that automated removal is always more efficient, especially if you are not sure whether you can delete everything on your own. Why is it that ReWinUp Cinema becomes a perfect vehicle for malware distribution? This program is supposed to improve your video watching experience on your browser, but it also supports commercial third-party content to support itself and cover its development costs. Thus, almost anyone could embed their links and content into ReWinUp Cinema’s advertising space. Since the application legally is not responsible for the third-party content, it basically washes its hands off anything that might happen to you when you click its pop-ups. You need to remove ReWinUp Cinema to avoid dangerous computer security issues. Please follow the instructions below to get rid of the application, and for any remaining files that might help the application regenerate, delete them with the antispyware program of your choice. Also, if you have any further questions about computer security, you can always leave us a comment. Press the Win key + R and the Run command prompt will open. Type %AppData% into the blank box and hit Enter. When the directory loads, locate the ReWinUp folder. Quick & tested solution for ReWinUp Cinema removal.